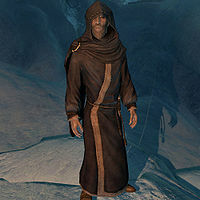 Septimus Signus was a brilliant scholar from the College of Winterhold who dedicated his life to studying the Elder Scrolls, a pursuit which drove him mad. Eventually, he had trouble even using coherent sentences, and often spoke in verse. He discovered a large Dwemer lockbox in an ice cave north of the College of Winterhold. Somewhere along the way, Septimus became a disciple of Hermaeus Mora, the Daedric prince of the unknown, who led him to believe this lockbox contained the Heart of Lorkhan, compared to which the knowledge of the Elder Scrolls was a mere "passing awareness". Septimus murdered, sowed dissent, and spread plagues on behalf of the Demon of Knowledge to gain his assistance in acquiring the Heart. But in order to unlock the lockbox, he needed the blood of the Dwemer. With the aid of an assistant, he collected the blood of the various Elven races and used the mixture as a substitute. However, once inside, Septimus did not find the Heart, but rather, the Oghma Infinium, which had been sealed within by persons unknown to deprive Hermaeus Mora of its power. Before Septimus could comprehend that he had been betrayed and used by the daedra, he disintegrated, and Hermaeus Mora's new champion, the assistant, claimed the Oghma Infinium for himself. Given his name, it is highly likely that Septimus was an Imperial. For game-specific information, see the Skyrim article. ^ a b c Events of Skyrim. This page was last modified on 21 October 2018, at 07:59.